Concerned about trusting Google with all of your personal data? Perhaps you should think more about it. The success of Google as a search engine, mail service, advertiser, social networking site, and recently a RSS aggregator makes it a question worthy of consideration. What should you want to know? What can you do about it? I’ll tell you. Some critics have pointed out the dangers and privacy implications of having a centrally-located, widely popular data warehouse of millions of Internet users’ searches, and how under controversial existing U.S. law, Google can be forced to hand over all such information to the U.S. government, or any other government of a country which Google serves. This should be worthy of pause for anyone. So Google has all these services you enjoy. Can you still use the internet without surrendering too much information to Google? I believe you can to a degree. For instance, you like to use that search bar in your browser? You could filter your Google searches through the folks at Scroogle and have the same functionality only without the trackability. 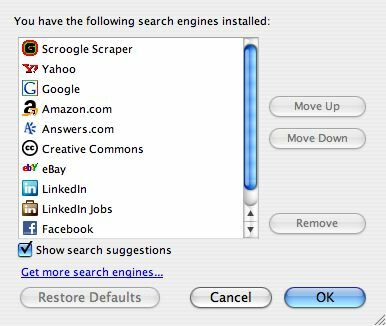 If you’re a firefox user, you can install their search engine plugin from mozdev.org, and set it to the top of your search preferences. If you combine this technique with addons such as Adblock Plus and NoScript, which are both in the recommended addons section of the Mozilla website, you will block most content dependent ads as well. This will hamper a lot of easy data collection by Google about your routine browsing activities and leave you more resistant to other problems to boot. I don’t think that I would recommend the use of TrackMeNot at this time as it basically crapflooding and doesn’t do anything about data being collected, but just adds a task of refining it. Even if you trust Google implicitly because of their “Do no evil” governing principal, realize that it is too juicy a prize not to be pursued by those with less noble goals. I remain unconvinced that ethics will triumph over greed in the long run.